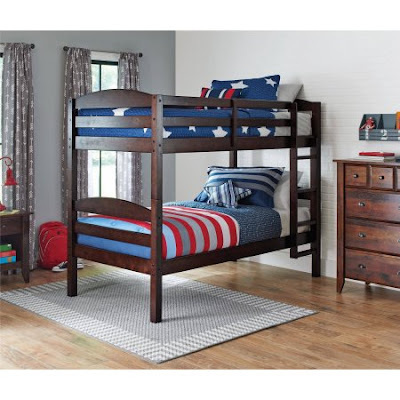 Savvy Spending: Walmart: Twin Bunk Bed Set (converts to two twin beds) for only $189 shipped! Plus $13 cash back! HURRY! Walmart: Twin Bunk Bed Set (converts to two twin beds) for only $189 shipped! Plus $13 cash back! HURRY! If you're looking for twin beds or a bunk bed, check out this Better Homes and Gardens Leighton Twin Wood Bunk Beds plus BONUS Mattresses at Walmart for ONLY $189 shipped – regularly $308.98! You can choose this Twin bunk bed set in Black, White, Gray or Espresso and it comes with two Spa Sensations 5″ Memory Foam Twin Youth Mattresses. This solid wood bunk bed set has an integrated four-step built-in ladder for safety and easily converts to two twin beds! The Bunk Bed Mattresses feature a moisture barrier that works to repel stains and wetness and prevent damage from accidents or spills. Plus Top Cash Back is offering 7% cash back on your purchases at Walmart! So just start HERE, type in Walmart, click "cashback" and then shop for the bunk bed as usual (just search for "Better Homes and Gardens Leighton Twin Wood Bunk Beds") . Your cash back will be activated. That means you'll earn $13.23 back in your Top Cash Back account, making this set only $175.77! Plus new members to Top cash Back earn a $10 bonus!! This is a *HOT* deal, so hurry if you're interested! Or share with a friend who may need this deal!